Florida students made bracelets and raised thousands to help those affected by Hurricane Michael in the Florida Panhandle. As she watched on TV the devastation Hurricane Michael unleashed on the Florida Panhandle, Christina Podlasek, 13, told her parents she had to do something. “People shouldn’t have to live like that,” she said. Within two months, Podlasek and her friends from Canterbury as well as Bishop Verot and Saint Michael Lutheran Church went to Mexico Beach where they presented mayor Al Cathey with a check for $9,321. “That was one of the most touching things I’ve experienced,” Cathey told The Star in Port St. Joe. “I was overwhelmed by their generosity and that they took the time to organize and dedicate themselves to this. The group is called ‘Kids Care Disaster Relief’. 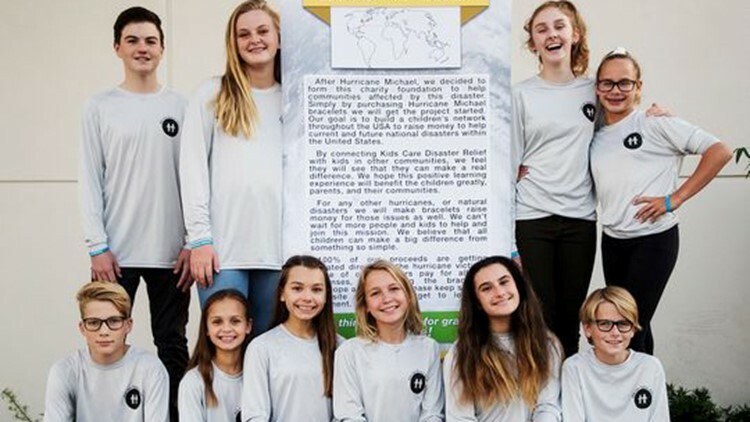 The 12- and 13-year-olds raised money by selling rubber bracelets, emblazoned with “Hurricane Besides Kristina, the other students who have been involved include Colin Cambell, Olivia Hoy, Marlon Engelhard, Nino Englehard, Lila Dinkel, Maya Shuster, Ella Dinkel, Reece Dinkel, Ellie Applegren and Kat Sanders. “I didn’t take it in until I got there,” said Kat, who’s 12. “When you’re there, it really hits you and you think of the how these people are worrying about the damage. Olivia, 13, said she hopes this gives people some comfort around the holidays. Christina thought the group made a huge difference while letting people know they haven’t forgotten about their situation. The group made part of the money by selling 2,500 plastic bracelets. They were emblazoned with “Hurricane Michael: October 10, 2018”. On the inside were coordinates of the storm. By Nov. 1, she and friends from Canterbury School started selling the bracelets for $5. Sponsors offset expenses by buying bracelets, stamps, envelopes, postage and other supplies. And then there were the donations. An 18-year-old girl – who has written three books and raised money for orphanages – sent a $2,500 check after the girls made the trip to Mexico City. This experience has encouraged Christina and the others to do more. With their nonprofit club in place, they’d like to aid other natural disasters. “If we keep on going, we can keep on getting more children involved and raise more money,” Christina said.